All of us at times do meaningless activities. We flip through channels on the TV or play silly games on our mobile phones. Sometimes these activities serve as “breaks” from more intensive activity or time fillers when waiting for a person or an appointment. But rarely do we finish doing an activity like that and feel as though we have accomplished something, nor do we usually feel like we have contributed to the world in a positive way. Not that we should be constantly out to change the world with our actions, but let’s face it, Candy Crush rarely made anyone feel better about themselves. I am always surprised at the focus on busy activities developed for people with dementia. 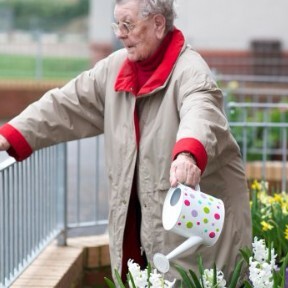 There has been a growing awareness in the UK of the important role of meaningful activity when supporting someone living with dementia, but the efforts to address the need for meaningful activity often slide into time filling activity rather than activity that helps the individual to connect to themselves, their connections and the larger world around them. 1. How does the process of the activity and being involved make the participant feel? Well-designed meaningful activities produce feelings of well-being, accomplishment, or connectedness. 2. How does the activity help the participant to stay connected with the person they have always been? Maintaining connections with past interests, networks and roles is especially important as someone living with more advanced dementia may struggle to maintain that sense of connection with their past that most of us take for granted. 3. How does the activity help the participant to feel like they have something to contribute? Not all activity has to be about contributing to the greater good, but feeling as though your efforts matter to someone else is what helps most of us get out of bed in the morning. Particularly when an individual enters care they lose their roles in everyday life. Now there is someone who cooks, cleans, maintains, and organises for them, and the roles they used to occupy dwindle. This can create a sense of uselessness within the person living with dementia. While I am not advocating the demise of the skittle set (we all need a bit of fun in our lives too), I am championing the way in which we are intentional about creating opportunities to participate in meaningful activity. We recently highlighted a bit of research done by Richard Ward, University of Stirling; Sarah Campbell, University of Manchester; and Professor John Keady, University of Manchester, which focused on the role of hair care in dementia. This is a great example of an activity that we can make even more meaningful by enhancing the experience of hair care. This is a normal activity that occurs in most care settings that helps people to connect with the person they have always been, and encourages engagement with people around them. We recently discussed the appropriate uses of television in care homes, and again the main link that made TV watching into a meaningful activity was the intentionality of the programming, the setting/participants, and the connection with past interests. There are many more normal, everyday opportunities similar to these mentioned here that be enhanced to become meaningful activities rather than just activities. Making Activity Meaningful for People with Dementia is a training program from DSDC is run on a regular basis, here participants will gain the knowledge and skills to develop a varied programme of activity in care settings which are person-centred and meaningful.